Established nearly 120 years ago with capital from the royal treasury of Emperor Gojong, Woori Bank has been at the forefront of building the framework for modern finance in South Korea. The bank is known for having been a trustworthy partner to its customers throughout many of the country’s historic moments. Woori Bank has a well-balanced business portfolio, which varies from household products and SMEs to large corporate customers, maintaining long relationships in each through a variety of banking options. Throughout the years it has forged strong relationships with large corporations, and is proud to be the main banking partner of Samsung, LG and POSCO, just to name a few. With these partnerships in place, the bank has contributed to the development of the Korean economy. Serving the Seoul Metropolitan Government for the past 100 years, Woori Bank has been chosen as the primary banking partner by more than 70 percent of Korean public institutions. In retail, it has secured a 22 million-strong customer base through differentiated strategies and innovative product offerings. In terms of overseas operations, the bank has a presence across 24 countries with a network of 218 branches – the most extensive overseas network of all Korean financial institutions. Today, Woori Bank is known across the world and is a NYSE listed company. 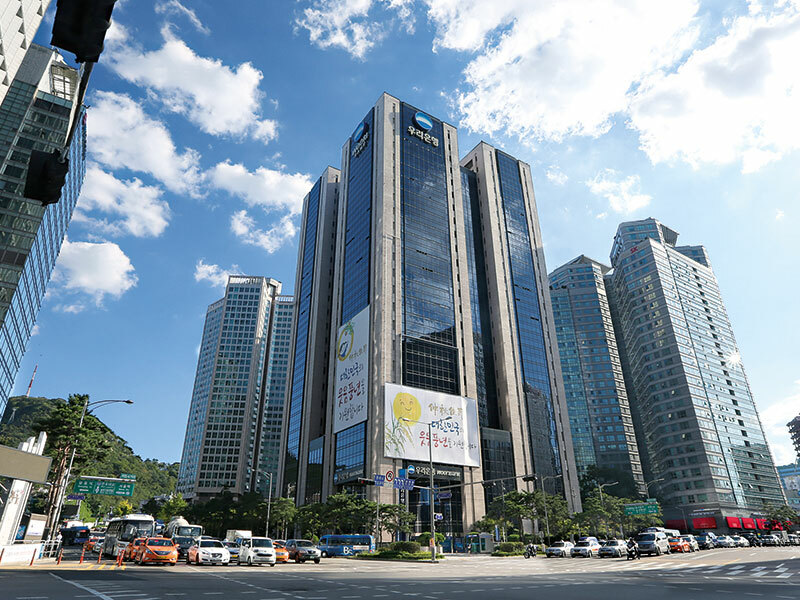 As the first bank in Korea to be listed on the country’s stock exchange – and as the first Korean financial institution to open an overseas office – it has been leading the way throughout its history. With this determination in place, the bank will continue to play an integral role within the Korean banking industry, based on its core values of customer satisfaction, honesty and trust. During the global financial crisis of 2008, Woori Bank faced some difficulties. However, an organisation-wide initiative to become more innovative led to some significant changes, starting at the top. By doing this, the firm was able to make a positive turnaround that has continued through to today, where all performance indicators – including profitability and asset quality – have improved. Investors have greatly increased their interest in the bank, mainly due to its improved fundamentals. In terms of profitability, the 0.2 percent return on assets at the end of 2013 rose to 0.5 percent at the end of Q3 2016, while return on equity increased from 2.5 percent to 7.5 percent. During 2016, the bank built a cornerstone to earn over WON 1trn ($867m) in net profits every year. Asset quality has also continued to improve. The bank has set strict credit limits to the exposure of each industry, and has strengthened credit assessments to pre-emptively manage potentially problematic assets. Woori Bank has also steadily reduced questionable sector assets, while increasing the portion of prime level assets. The emphasis on risk management has led its non-performing loan ratio, which was 2.99 percent at the end of 2013, to reach 1.05 percent at the end of September 2016. The coverage of non-performing loans, meanwhile, picked up from 82.3 percent to 156 percent. Improved financial performance is not the only good news to come out of the bank recently. The long-awaited privatisation of Woori Bank has recently been finalised: the Korean Government sold off 30 percent of Woori Bank shares to private entities as its majority ownership changed for the first time in 16 years. Successful privatisation has increased the market’s expectations immensely. The bank is confident it will meet these expectations as new corporate governance will provide stability while management actively pushes forward on business diversification in order to increase business opportunities. In an environment where the boundaries between finance and IT are breaking down, Woori Bank is actively promoting fintech to be its next major driver of growth. In May 2015, the bank launched South Korea’s first ever mobile-only banking service, known as WiBee Bank, later adding a mobile messenger service, WiBee Talk. It also released an online open market service called WiBee Market to establish a comprehensive mobile platform. At the time of release, these services were all unprecedented in the Korean financial industry. The WiBee platform offers a wide variety of services. For instance, customers can use their smartphone apps to sign up for mobile-only deposits with preferential rates and loans, use the simple payment system service, and apply for travel insurance. They can also use WiBee Talk for convenient money transfers. Furthermore, Woori Bank has been a driving force in taking initiatives across the fintech industry. It was the first bank to implement payment and ATM withdrawals using Samsung Pay, and also introduced an iris recognition system for mobile banking. To overcome the low-growth, low-margin environment, the bank is proactively searching for new revenue streams. As a financial institution with the largest global network in Korea, Woori Bank is continuously expanding its presence and business overseas. It is particularly focused on the southeast Asian market, where its competitive strengths in retail and mobile banking are set to significantly enhance its business. Asset management will be another key pillar for the bank’s future growth. It will continuously strengthen its capabilities and improve its service in asset management to not only maximise customer satisfaction, but to also build on its earnings potential. With its overall aim to become the leading wealth management business in Korea, Woori Bank provides total customised financial solutions to its clients through its specialists, advising on matters of wealth management, tax and real estate. Furthermore, it hosts its Asset Allocation Strategy Committee each month to strengthen the bank’s expertise in customer asset management. The decisions made by the bank’s committee are used in the selection of recommended funds and the setup of private equity funds. The outcome from the committee meetings can be seen in its sample portfolio, and in making real investment decisions regarding the bank’s discretionary ISA asset management. Securing a higher yield than the market rate is an objective Woori Bank strives for when making product recommendations and creating a model portfolio based on the stability of assets. The bank’s focus on managing a stable portfolio stems from its acknowledgment that commercial banking customers have a more conservative approach to banking, and therefore they have a higher preference for mid-risk, mid-return products, compared to high-return products. Woori Bank carefully looks into not only the past performance of relevant funds, but also the risk management indicators – such as standard deviation of return and information ratio – whenever a customer is selecting products. When evaluating the investment product performance, the bank puts more emphasis on products that show stable returns over the longer term, to ones that have high returns in the short term. The deterioration of profitability due to the current low-rate, low-growth environment is bringing about immense changes to financial companies and their channel strategy. As the deposit rates offered by banks have been decreasing, the importance of non-face-to-face channels – which can provide higher rates and greater convenience to some customers – has increased, especially to consumers more familiar with online or mobile banking. Customers can purchase wealth management-related products, such as funds, insurance, foreign currency, gold, pensions and discretionary ISAs using non-face-to-face channels. Woori Bank has also established its online WM Centre, where customers can directly consult with advisors through video conferencing using the bank’s homepage, or by phone or email. These advisory services are mostly focused on market analysis, product marketing, customised product planning and effective rebalancing of existing assets. The adoption of a ‘robo-advisor’ service has also eased the client qualification criteria, and will expand the bank’s overall customer base. For these robo-advisors, Woori Bank is developing a pilot programme service called Robo AD-Alpha, which will be fully implemented in the coming months. This new systematic and specialised asset management service will recommend customised investment portfolios. It will also automatically rebalance these portfolio and financial products through a computer algorithm that is equipped with artificial intelligence, thereby analysing big data related to customers and transactions. Robo AD-Alpha will stretch the asset management services currently provided to the bank’s high net worth customers across its affluent and mass-market customers, through personal computers and mobile devices. Not only will this service accommodate the diverse needs of all its customers, it will also contribute to the government’s drive towards expanding asset management services. The recommendations from Robo AD-Alpha will be frequently used in managing ISA and pension accounts, so the bank can increase customer returns and build a stable portfolio.